Anthony Watts has posted a press release about an initiative by Tim Osborne and Phil Jones at CRU (archived here). 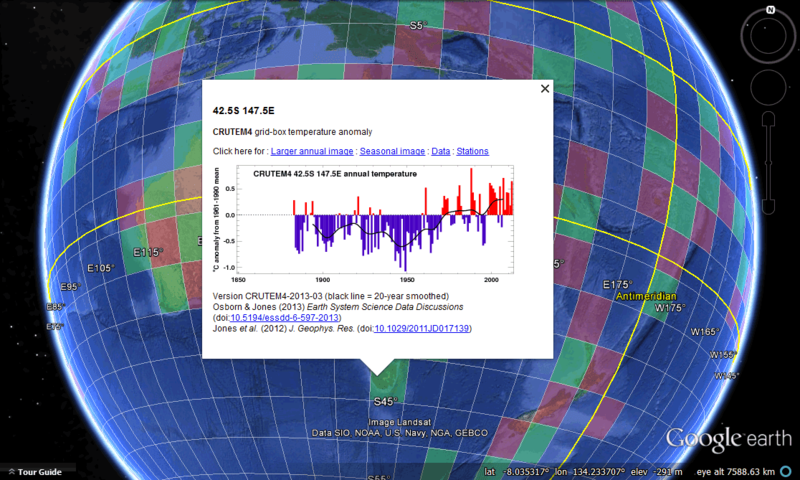 What they've done is plot temperature land surface temperature data (CRUTEM4) on Google Earth. It's more than a fun and interesting way to see what's happening to surface temperatures around the world, it would have been a big job. They've made temperature data more meaningful and accessible to the public using one of the best things to happen since sliced bread - Google Earth. Here is what happens when you click on the grid over Tasmania (click to enlarge). You can click the links in the pop-up to get more data. It really is very, very nice. The exercise is written up in Earth System Science Data here. You can get the .kml file here and open it in Google Earth. Anthony Watts is in favour of the exercise, copying the (unreferenced as usual) press release under the headline: "CRU produces something useful for a change". Which is about the most praise that any reputable scientist would ever get from a science rejector like Anthony Watts. Climate researchers at the University of East Anglia have made the world's temperature records available via Google Earth. The Climatic Research Unit Temperature Version 4 (CRUTEM4) land-surface air temperature dataset is one of the most widely used records of the climate system. The new Google Earth format allows users to scroll around the world, zoom in on 6,000 weather stations, and view monthly, seasonal and annual temperature data more easily than ever before. Users can drill down to see some 20,000 graphs -- some of which show temperature records dating back to 1850. The move is part of an ongoing effort to make data about past climate and climate change as accessible and transparent as possible. Dr Tim Osborn from UEA's Climatic Research Unit said: "The beauty of using Google Earth is that you can instantly see where the weather stations are, zoom in on specific countries, and see station datasets much more clearly. The data itself comes from the latest CRUTEM4 figures, which have been freely available on our website and via the Met Office. But we wanted to make this key temperature dataset as interactive and user-friendly as possible." The Google Earth interface shows how the globe has been split into 5° latitude and longitude grid boxes. The boxes are about 550km wide along the Equator, narrowing towards the North and South poles. This red and green checkerboard covers most of Earth and indicates areas of land where station data are available. Clicking on a grid box reveals the area's annual temperatures, as well as links to more detailed downloadable station data. But while the new initiative does allow greater accessibility, the research team do expect to find errors. Dr Osborn said: "This dataset combines monthly records from 6,000 weather stations around the world -- some of which date back more than 150 years. That's a lot of data, so we would expect to see a few errors. We very much encourage people to alert us to any records that seem unusual...."
What is amazing is the number of WUWT readers who are not only unimpressed, they think it's all part of "the Climate Conspiracy". One gets the feeling they wouldn't have a clue how to use Google Earth let alone add in the data that the scientists have provided. I've listed some typical comments so you can see the sort of conspiracy-mongers and general nincompoops who gather at WUWT. I mean many of them haven't even bothered to look at the data and they obviously wouldn't understand it if they did. Look for yourself. This isn't just the odd stray conspiracy theorist. This is a full on collection of utter nutters - typical of the people for whom Anthony Watts has designed his anti-science blog. If you specialise in wilful ignorance you'll attract the wilfully ignorant. Anthony Watts has got just what he bargained for. So will it now be possible for independent analysts to ascertain if CRUTEM4 is reliable as an indicator or if “warming” has been added lately by reducing pre satellite era temperatures through “adjustments”? Are those temperature records raw data or have they been, “Hansen-ed”? Is not putting carefully-selected everythings on Google a good way of turning doubtful computer-generated data into accepted truth to underwrite the CAGW narrative? “A lie will be halfway round the world before the truth can get its boots on”. One of Stalin’s favourite sayings just may be the watchword behind this move. CRU has form in this matter. As a few others have already touched upon it would be interesting to see if you could run “reports” using unadjusted temperature data wouldn’t it? Somehow I doubt this data will be available? Hopefully I’m wrong and unadjusted temp data is available but I suspect it’s not. Notice the wording. ‘Temperature records’. Peresumably these are the adjusted, sanitised and greenpiss approved temperatures. What’s the point. Let’s see the RAW date. You know, the stuff they haven’t adulterated in the name of CO² tax. Regarding others comments about data adjustment, I also tend to view with suspicion. If unreasonable data adjustment has taken place, it might be fairly easy to find out (in reasonably developed areas at least). Take your local ‘main’ library for example, it may house weather records, or a copy of them. Hence, a bit like the surfacestations project, a number of volunteers could perhaps search for the ‘written’ information and then compare to the ‘official’ record shown on this dataset? Much as I am sure that many older written records could have been removed (intentionally or not) – I’m also sure that many will remain forgotton on dusty bookshelves! Are the figures fudged or unfudged, dare one ask? I do not think anything from CRU deserves such automatic trust and admiration, although I admire the generosity of spirit that such responses reveal. My own immediate reaction was less noble. It was along the lines of ‘what are they up to now?’. I would like to see some critical review of this product. In any event, I got a situation with another character who goes by "The ScottishSkeptic". It's a case of the ScottishSceptic tasting a drop of his own medicine and hating it. I'm sharing it here because I figure the more that know about how the "climate science skeptics" behave in real life, the merrier. That article of yours is going to endure as a classic, CC. With icing on the cake, Monckton-style, from the Scottish Pseudo-Skeptic! Tssss... Lure that guy into sueing. A time is a-coming where the suits filed against the tobacco industry will be ice cream change compared to those against the sources of climate revisionism. Looks like it is actually beginning now. The idiots haven't a clue, yet. Mike Haseler (the "Scottish" "Sceptic" who is neither a Scot nor a sceptic) is prone to making litigious noises. He is a bluffing windbag. Tell him to engage a solicitor and proceed. Watch him vanish. Citizenschallenge. I wouldn't worry too much about his copyright claims since you are explicitly critiquing his statements and §106 of the Copyright Act explicitly allows use for "purposes such as criticism, comment, news reporting, teaching (including multiple copies for classroom use), scholarship, or research" in most cases. Dr Osborn said: “This dataset combines monthly records from 6,000 weather stations around the world – some of which date back more than 150 years. That’s a lot of data, so we would expect to see a few errors. We very much encourage people to alert us to any records that seem unusual."